dineLA Restaurant Week is upon us once again, this time very soon after the last. But the restaurant business needs some influx of business so as usual, I am there to support the economy. After I forgot to follow my own dineLA restaurant criteria last year and had an unsatisfying night at Asia De Cuba, I made sure that I did the necessary research this time round. The criteria is simple. #1 The restaurants have to offer you a good deal. If you add up average prices of appetizer, entree and dessert on their regular menu and it's about the same price or lower than the dineLA prices, don't bother with it. You are better off just ordering from the regular menu #2 If the restaurants offer dishes on the menu that you would actually want to eat. This requires doing some menu research. After all, would you really want to pay $44 for a green salad, salmon and sorbet? After doing some research, we decided on Petrossian. I had read some positive reviews during the last dineLA so I was excited to try. Additionally, the regular menu prices are pretty steep so I knew we'd be getting a deal during this promotion. 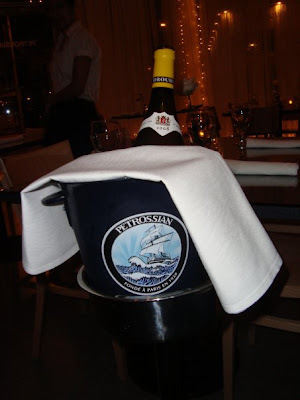 Petrossian is a specialty market/restaurant that is known for its gourmet food, specifically caviar. The restaurant is separated into the dining room and the marketplace that has casual seating and a communal table as well as a food section that offers whole foie gras, caviar, chocolates for sale. The marketplace would be a perfect spot for an upscale happy hour. Even though it was a Monday, I was surprised to see that it was empty since it was Restaurant Week. 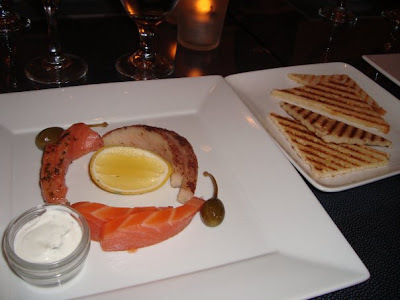 Perhaps a lot of people do not realize that Petrossian offers dining in addition to specialty items. There's no valet which can be a problem but it wasn't for us on a Monday. The West Hollywood outpost is less stuffy than its NYC sister. 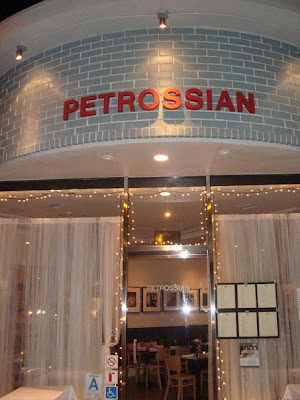 Petrossian was renovated last year for a more modern update. The decor is what you would expect: fancy, classy yet simple. 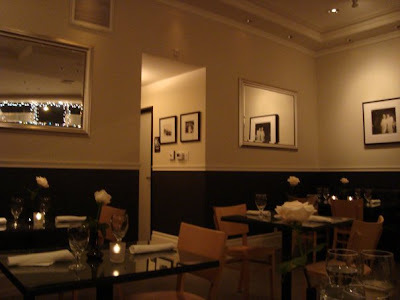 The black and white walls are decorated with pictures of old Hollywood stars, menu and table tops are leather. They also have a sidewalk patio area. 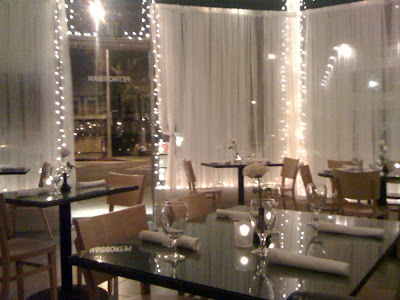 For dineLA, $44 gets you a starter, entree and dessert. Most of the items on the dineLA menu are new, things that the chef newly created. The chef is Benjamin Bailly who has worked at a couple of Joel Robuchon's restaurants and most recently was sous chef at L'Atelier de Joel Robuchon in Las Vegas. With this exceptional resume, you know to expect exquisite food. 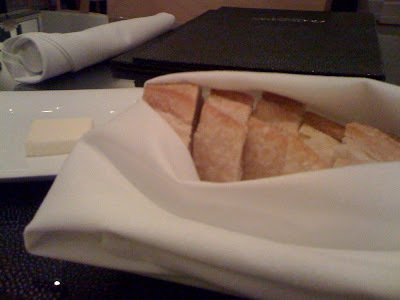 Bread was served upon request and we ordered a glasses of champagne each. There were three choices for each course and thankfully we were a party of four so we were able to try all the choices between us. You HAVE to order something with caviar when you are at Petrossian. This plate looks simple but it was actually more delicate than meets the eye. The chef really took the effort to slice each green bean lengthwise. 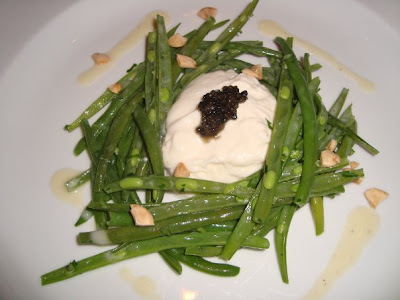 The burrata was fresh and mild and the caviar added a nice saltiness to the salad. Everyone really enjoyed this starter because it was simple but yet delicious. The shrimp was wrapped "in paper" and deep fried. 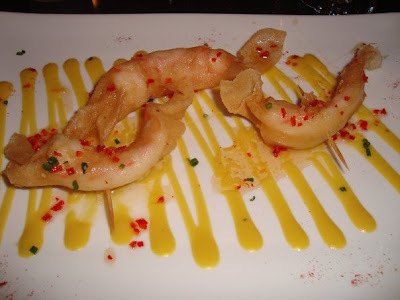 There were three plump shrimp pieces which is a decent sized starter at a fancy restaurant. The chili sauce tasted like Thai chili sauce that you would find in a Thai restaurant. I enjoyed this dish but I didn't think it was anything unique and felt that you could get something similar at any Asian restaurant. The salmon was fresh and very good quality. It was served with creme fraiche and dill on the side. If you like salmon, you'll have to order this. You're at Petrossian after all. Bottle of Macon Village White Burgundy. The fish was basically mashed up with potatoes and pepper, then topped with an egg. Lovely presentation. I thought the dish was interesting but the flavors didn't win me over. However I have to caveat that it's a personal preference. I don't like olives and I thought the olive oil had a very strong flavor. Initially no one at the table wanted to order this dish because pork belly is so rampant in restaurant menus and so 2009. Thankfully Dilu decided to take one for the team. As it turns out, we all felt that this was the best entree of the night. 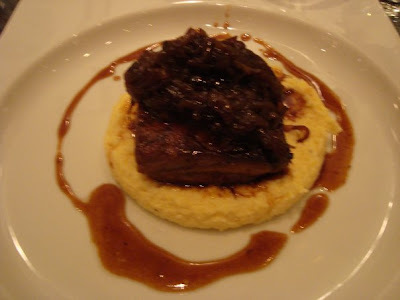 The skin was seared with a coating of caramelized sugar, the belly was fatty and tender and the polenta was creamy and delicious. This was the type of dish that you couldn't stop yourself from taking more bites. Very well executed and the flavors were amazing. I would definitely be back for this and thanks to Chef Bailly for making me fall in love with pork belly again. I had to order this because I was intrigued by the crispy peanut egg. It's basically a soft boiled egg that was coated with peanuts then fried for a quick second. The veloute was a puree of asparagus and was creamy and satisfying. 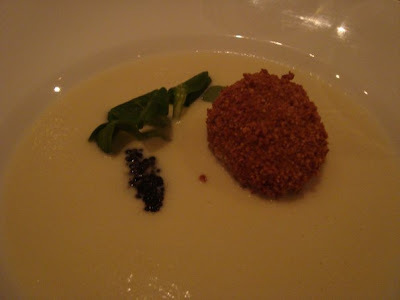 The caviar was salty and added a fishy essence to the veloute. 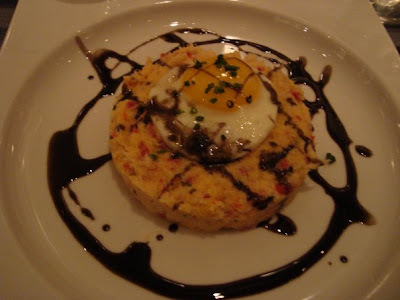 I enjoyed this dish and thought it was unique, however it seemed more of a starter than an entree. 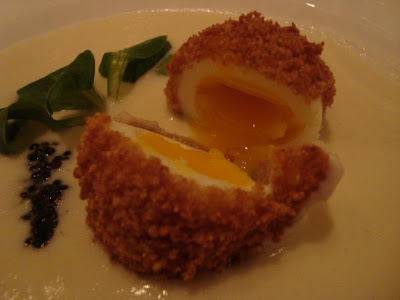 The crispy peanut egg with yolk oozing into the veloute. Gorgeous. Next up was dessert. Unfortunately, everyone was eyeing two of the three items so no one ordered the panna cotta which I'm sure would have been good. 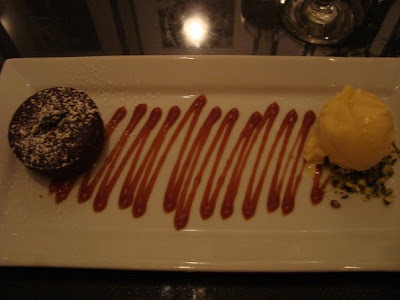 Moelleux means soft or moist in french so we were expecting a molten lava cake of some sort. Unfortunately the cake was a bit overdone, was not moist in the midden and was a little dense. Still delicious but it could have been so much better. 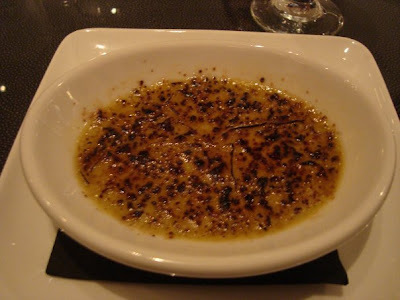 Creamy and rich custard with an amaretto flavor, topped with a very thin layer of caramelized sugar. Very tasty. Our waitress was nice and accommodating especially when one of our party was running 20 minutes late. However she did not refill our wine glasses on three occasions which was surprisingly as there were no other guests in the restaurant at the time. The food was good and inventive. It really lives up to its brand of decadence, indulgence and elegance. 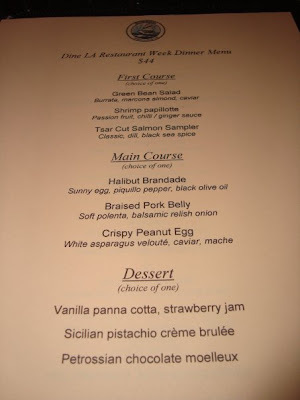 I thought the dineLA menu was a great deal. Our bill came up to $100 each including tax and tip, but half of which was for the two bottles of wine and 4 glasses of bubbly. I am glad that I finally got a taste of Petrossian which really whet my appetite. I already know what I'd like to order during my next visit: wild mushroom cappuccino, foie gras creme brulee and black truffle mac 'n' cheese. dineLA Restaurant Week is a great opportunity to check out new restaurants. Just make sure you do the necessary menu research before hand or you might be disappointed. glad to have read your review since i'm going here for dineLA next week! blah! I should've visited last week for lunch! Thanks for the update! cool, i'm getting the pork belly and green bean next week! thanks! Hi Daily Gluttony and Pandalicious - hope you guys have fun at Petrossian. Can't wait to read about it!